One of the main stressors leading to divorce is debt. Debt may be a main point of contention before, during, and after divorce. You and your former spouse may have decided to split all of your debt 50/50. You may have kept only the debts in each of your respective names. Your spouse may have agreed to refinance the home mortgage to remove your name. The multitude of outcomes depends on the unique facts of your case. However, no matter the outcome, you believe that you resolved the debt issue once and for all when your divorce decree was finalized. If only it were that easy. What does a divorce decree really do with debt? For example, suppose as a part of the divorce, Spouse A agreed to pay 100% of a joint credit card. In the future, Spouse A becomes unemployed and stops paying the credit card payment. The credit card company will seek payment from Spouse B as well. It won’t take into consideration what Spouse A and Spouse B agreed to as a part of the divorce. What happens when a person files for bankruptcy after a divorce is final? The federal bankruptcy law’s impact on divorce-related debt can be daunting and confusing. Many times, Spouse B receives the bankruptcy notice without any forewarning from Spouse A. If you are Spouse B, you have no idea what this means and how it impacts the debts you had dealt with in your divorce. Your spouse agreed to pay 100% of the credit cards that were in both your names. 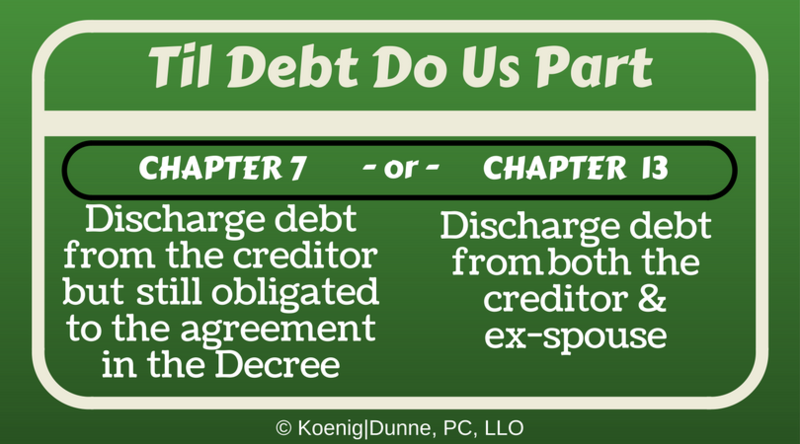 Chapter 7 and Chapter 13 bankruptcy treat divorce-related debts in different ways. In a Chapter 7, the filing ex-spouse may be able to discharge or eliminate his or her obligation to the credit card company. However, the filing ex-spouse is not exempt from the obligation to the non-filing ex-spouse to repay 100% of the credit card debt pursuant to the divorce decree. The person filing the bankruptcy may not ultimately receive as a fresh of a start as originally thought. In a Chapter 13, the outcome is different. The filing ex-spouse can discharge their obligation to both the credit card company and the non-filing ex-spouse to pay 100% of the credit card debt pursuant to the divorce decree. This is sometimes referred to as the super-discharge. It may be the main motivating factor for filing a Chapter 13 over a Chapter 7. What to do if you’re struggling with divorce-related debt? Meet with an experienced bankruptcy attorney who is well-versed in divorce-related debt issues. At Koenig|Dunne, we are here to help you when divorce and debt collide.